Irish Angel Christmas Tree Ornament with Shamrocks, an Irish Blessing and a Dove. Sorry, this Irish Christmas ornament is now sold out. 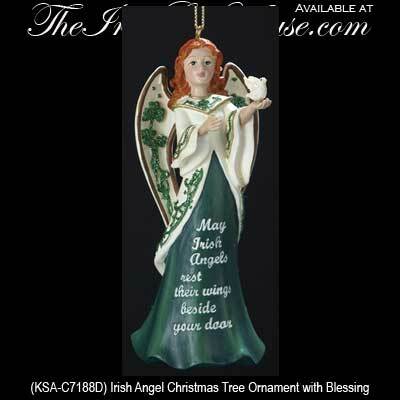 The blessing on this Irish ornament reads: May Irish Angels rest their wings beside your door. Irish Angel Christmas Tree Ornament with Shamrocks, Blessing and Dove. Gift Boxed, Ready to Hang.